I need to get faster. If my goal is a BQ then i need to start running more tempo, more fartlek, and dare i say visit the circular heathen known as the track. However, until my summer vacation begins, i will more than likely be doing any faster types of runs with the Babyjogger and Dirrty Feather. Let's get one thing straight. Babyjoggers are not meant for speed. I dont know what the fastest mile recorded pushing one of these plush chariots is, but dipping under 7 min a mile and it starts to get a bit shaky. Not to mention that your own natural rhythm in relation to arm swing and stride all need to be altered. Through the miles with little dirt dawg, i feel that i have develped a pretty good system. 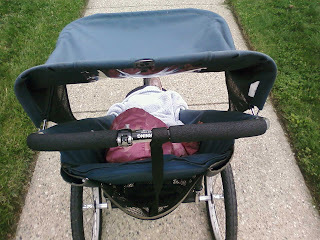 One, on a good stretch of road i can push the stroller ahead for at least a few paces until giving it another nudge. Two, any big bumps two hands need to be placed firmly on the the bar and guide it over. Three, and perhaps the most important on any turn, slight pressure is applied as the front end goes up and the back two wheels turn in the direction needed. After all that, dirrty feather and i ventured out for a little tempo run today. After a mile warmup and with dirrty feather happily munching some chocolatey goodness known as Teddy Grahams, 3 mile of tempo lay in front of us. Hard to get consistent miles in, but got the fastest mile in this year so far @ 6:53. Maybe running with the Babyjogger will be my secret training weapon in my pursuit of speed. Eating gels on long runs have become as commonplace to me as drinking java, however, I forgot that Dirrty Girl had not had one in quite some time. The goal during today's 10 miler, was for her to practice ingesting one at about 7 miles to see how she would handle it in prep for her upcoming half marathon. I am not sure there is such a thing as gel reflux, but it certainly sounded and looked like what happened as I passed off an Apple Cinnamon gel to Dirrty Girl. As Dirrty Girl herself put it, "I wasn't quite ready for the consistency of it." Good thing we have another run or two to practice! 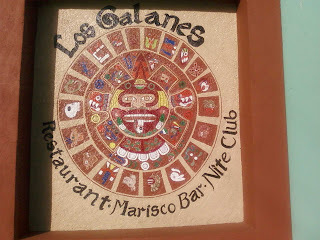 If you can somehow figure out how to get through the mess that MDOT has constructed in and around the D, a wonderful little gem known as Los Galanes exixts in Mexicantown. The Pacifico was cold, the salsa spicy and the tacos refreshing. A good place to take a little break. Another year, another candle. Not enough to move up an age group, but does it mean i have to go an change all my heart rate training zones based on a year difference? Dirrty Girl got me a sweet gift that has us going down to Cleveland in September to see the Tigers, but in the back of my mind, I was like, is that date going to interfere with a race I have picked out for the D.D.M.C. #10 a potential Boston Q? I love you the most, Dirrty Girl has squealed several times after slipping into her new Nike Air Structure Triax. I would have never picked them for her given the propensity for them in the past to run narrow, but the helpful staff @ Hansons said that apparently Nike has made a conscious effort to study women's running and design gender specific shoes based on the way they run. Whatever the case, Dirrty Girl is excited and is working on some pacing to maybe dip under 2:10 @ the 1/2. She doesn't know it yet, but that is my goal for her! After a sizzling 7 miler led by Missile and Lightning, and some kicked up french toast, we gathered around the computer to watch an albeit fuzzy live feed of the women's marathon Olympic trials. I think the USATF is on to something making the marathon trials a day before major marathons, in this case Boston, and Missile, I think spoke for us all that she had goosebumps as Deena Kastor, Magdalena Lewy Boulet, and Blake Russell made the USA Olympic Marathon team that will be competing this August in Beijing. Congrats. The "puffed" concoction you see dirrty feather fueling herself with before today's run is apparently known as KIX. It's kid tested and mother approved beamed dirrty girl as she filled the bag for dirrty feather. Hmm....No Lucky Charms for Little Dirt Dawg, but Kix for Dirrty Feather? so that you can watch the Women's Olympic Marathon Trials on Sunday morning beginning @ 8 am. I wish all the qualifiers good luck but secretly will be hoping that a few of the Hansons Distance Project ladies sneak in there to nab one or maybe all of the 3 spots for Beijing. Going into my 4th day of post marathon recovery, I was feeling pretty good. Some slight soreness in the quads and hams, but nothing that imobilized me. Figured I would amble in the morning for 5 miles, running 5 minutes and walking 5 minutes while taking the dog. Easy run..1 hr 7 min..
Today is Thursday, so that means Fun Run @ work! A gentleman's agreement was made between Twinkle Toes and I to keep the pace slow due to my recovery and his ashphalt gobbling skinny tired race later that evening. 3.25 miles in a hair over 30 minutes. Dirrty Girl and I had struck an agreement that she would due her long run tonight (9 miles) so I was already to take the kids to the park and for some ice cream when she called and said the gparents wanted them for a bit. Upon her arrival home, I said I would do the long run with her, but in a surprise, dare I say shock, Dirrty Girl turned me down and said she was in a zone to do her long run on the treadmill and watch Wuthering Heights. Dismayed, I was like what am i gonna do? Tigers aren't set to club the Indians for a few hours, and the weather is nice, so why not go for another run? Another 5 miles covering the same loop as this morning, but instead running 8 minutes and walking 2. As I gingerly and slowly work the lactic acid and tightness out of my body, I get frustrated and excited seeing fellow runners out there moving freely and getting into the zone. No doubt the miraculous turn in the weather has had something to do with it, but nevertheless soon i will be moving freely amongst them. In other news, the official results were posted today for the Glass City Marathon and showed a 3 hr 24 min 46 sec time for me. A seven second difference in the time I recorded and since there were no timing chips, i am going with mine. Although I did not even crack the top 5 in the 30-34 age group, i did finish 39th out of 428 finishers which put me in the top 10% of all finishers . Pretty cool. Now all I have to is work on Dirrty Girl and try to get a trip to Clevland for D.D.M.C #5. D.D.M.C. #4 = NEW PR!!! Earlier in the week, as Dirrty Girl and I talked about the Glass City Marathon and the predicted crappy weather, she was like, "Well, why don't you just pick another marathon?". My response, "I already paid for it." Another friend said to think of it as a character builder. Sitting, in my car prior to the start, the weather report had been true: light rain showers, snow showers, and a blowing wind. Even with a temp in the mid 30's it felt much colder and I struggled with several clothing options until I decided on the following: half tights underneath a pair of Brooks Tights, a midweight zip top base layer, North Face SS shirt, and a Nike Windshirt. 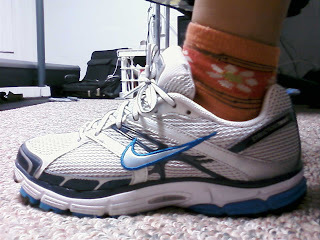 On the feet were a pair of Injini socks and my newly broken in Nike Air Pegasus, circa 2006. Stayed in the car as long as a I could and when I ambled out to the start, the race director reported a temperature of 36 degrees and the following statement: "Well the weather is bad for spectators and not so good for the runners." And with that we were off. I really entertained no time goal other than to get under 4 hours considering that the first 3 marathons in the D.D.M.C. were solo and rather easy. Figured with some other hearty souls there it was rather achieveable. No timing chips or pace groups for this race, so off I went and the first mile went by in 7:51. Hmm, I thought, bit fast. Somewhere btwn mile 1 and 3 I hooked up with some guy and in conversation began a long diatribe for the better part of 10 miles about ultrarunning, training, and so forth as he was working on his 42 second marathon and was prepping for another 100 miler this summer. Eagerly, I asked for info and he obliged. In the meantime, we managed to cover miles averaging btwn 7:39 to 7:26 and even managed to run with the lead female for a bit. Soon enough we parted ways, and i hit the half marathon mark in 1 hr 38 min and some change. Someone blurted out I was on pace for a 3:16 finish? As I hit the turnaround and wiped the snow showers from my eyes, I was in a bit of disbelief. I felt really good given the weather, but now the question remained as I made the turnaround and had the full brunt of the wind and the weather was detriorating was how much did I want to hurt? If I blew up, I probably could come in under my PR of 3 hr 33, but by how much and if I kept pressing how close could I stay on pace for that 3:16? The next 7 miles were no fun as the rain showers turned to snow showers and the wind was blowing right at me, but I still managed to hit the 20 mile mark on pace for a 3:18 finish. Closing in on home, I encountered one problem. My hands were so cold that i could not unzip my pockets to get HammerGels out and had to resort to using my teeth. The final 10k pretty much sucked as I ran into people who were underdressed and looking like on the verge of hypothermia and i was getting pretty chilled as I was soaked to the bone. Soon enough the finish was in sight and a new PR of 3 hr 24 min and 39 seconds was mine! Hurriedly, I made my way inside for some chicken soup and drink, before heading off to the car to get out of the wet clothes that seemed to weigh another 5 lbs. Interesting to note that even with the Injini socks, I still ended up with a rather large blood blister on one my toes. First one I have ever had, and will count it up as coming with running for the better part of the marathon on wet feet. I am stoked make no mistake. Even with the D.D.M.C. challenge now 25% over, I have been toying with the idea of making a run at a Boston Qualifying Time (3 hr 10 min) this fall. Given my training to date, perhaps it is within my reach?? The deal brokered with Dirrty Girl for 08, was that in order for me to do the D.D.M.C. that I had to promise to do a couple of things. One, help her establish a training program to enable her to run a 1/2 marathon and two, run with her during that race and whatever training races we were able to do. Today under ideal early spring conditions was the Martian 10k. Trying her best to get in the runs I prescribed, Dirrty Girl felt that she could blaze the course in about one hour. Secretly, I thought she could dip under that. Dirrty Girl met with the race director before the race and was ensured that if I did stray to far away that the homing ray would paralyze me until she caught up. Mile 1 was covered in a brisk 9:23. Mile 2 slowed by just 7 seconds to 9:30. Smiling to myself, I was like, oh man, she is gonna do this easily! Mile 3 was covered in 10 minutes flat. Dirrty Girl commented to another pair of earthlings who passed stating that they would use her as a pacing guide responded with, "You know the tortoise and the hare? I will be the one with the shell." Dirrty Girl, in the zone. The talk with God must have worked because she responded with a 9:31 for mile 5. Mile 6 included a decent hill, and Dirrty Girl began feeling the effects of her effort with "my stomach hurts" and " i think i am gonna throw up". I told her that she wasn't and it was just a sign that she was working hard. Crossing the line in 1 hr and 25 seconds, Dirrty Girl established a new PR. Walking back to the car, plans were already being discussed about preparations for the the 1/2 marathon that are a mere 8 weeks away. Not a bad way to make the first Detroit Tiger game that little dirt dawg will remember by me getting tickets from my boss, getting to work a 1/2 day and then telling people I have an appointment as to the reason why I was leaving. I had an appointment all right, right there in section 113! Little Dirt Dawg was more than happy to meet and greet Paws, do a quick photo-op and then dine on ball park franks and peanuts. Mission accomplished as we made it to the eighth inning and upon departure indicated interest in going again. Yes!